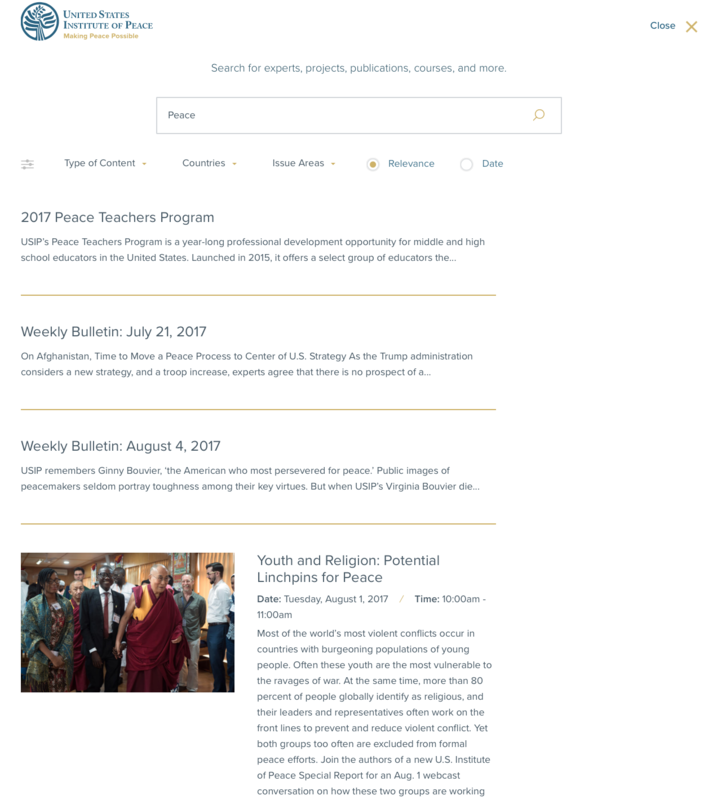 When the United States Institute of Peace (USIP) partnered with WDG for their Drupal 8 website redesign, our development team suggested integrating Apache Solr to power search features for improved search functionality and performance. Apache Solr is Java-based, open source enterprise search platform built on Apache Lucene that is reliable, scalable, and fault tolerant. Solr is a premier choice in indexing and searching content with easily filterable results. Using Solr allows you to control return results and incorporate dynamic facets through a particularly powerful solution. USIP originally sought a way to make content discovery easier for users. In addition to flattening out the site navigation, we focused on improving the search experience on landing pages to make them more relevant for the user. 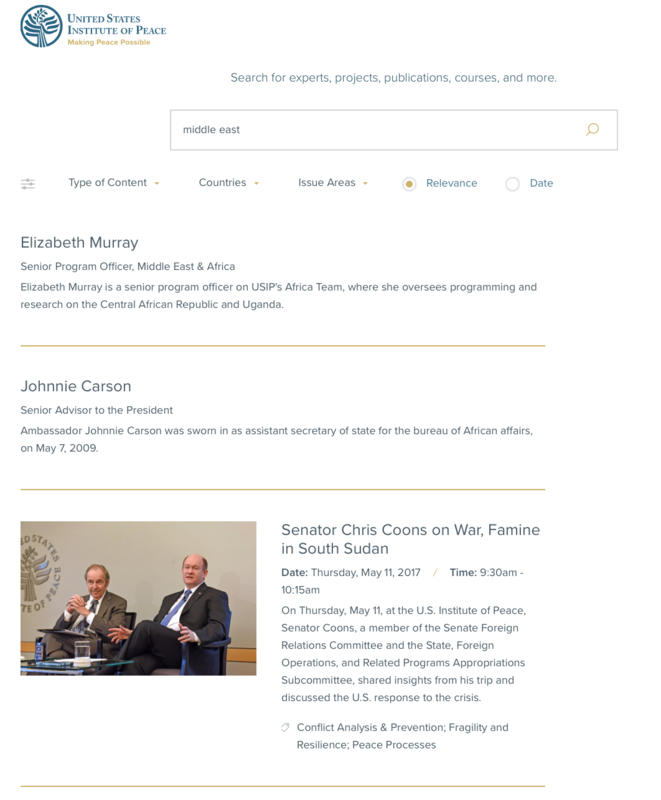 The unique aspect of this implementation for USIP is that all of their landing pages were powered by Solr. From Publications to Events, Regions, Fellowships, and Projects, each landing page was equipped with quick facet and keyword search capabilities. This enhanced the user experience by exposing keyword search at all levels, not just for site search. For example, the Events landing page is filterable by “Upcoming”, “Countries,” “Issue Areas,” “Experts,” “Centers,” and “Keywords.” This is unique because while we often do employ filters within other pages of the site, we simultaneously exposed full text keyword searching within each of these landing pages. Full text keyword search was implemented specifically for USIP because it searches not only the title for keywords, but all of the content within the node. For example, if a particular word is mentioned, the search will return the result not only because that word is included in the text, but based on various relevancy factors from Solr that boost return results. These relevancy factors include term frequency, length norm (matching a smaller field score as higher than it would match on a larger field), coordination factor (multiple terms in the search query), and inverse document frequency (making rarer terms match higher). In searching “Peace” by relevancy, for instance, the first returned results are not necessarily the most recent, but rather those that match the search relevancy most closely. Publications outside of news updates are also included in the search return, including expert profiles, blogs, and more. This creates a broader field of possibilities in search results with more tailored content curation. With Solr, you can also set up custom relevancy based on dates, where more recent content can be prioritized towards the top of the search. This adds a dimension of usability to the user experience for viewers seeking more recent content. Most importantly, this permits the end user to quickly find an upcoming or past event without sifting through complex pagination. As part of the improved UX, we restructured the interface to make the hierarchy and taxonomy of the site more intuitive for the user. For example, regional taxonomies were implemented in addition to country taxonomies to be leveraged for an improved UX; users can search for “Iraq,” or they can search by region of “Middle East” to add relevancy to the search query. This also allows our team to use the same data set for site search, but performs searches across content on the whole site. 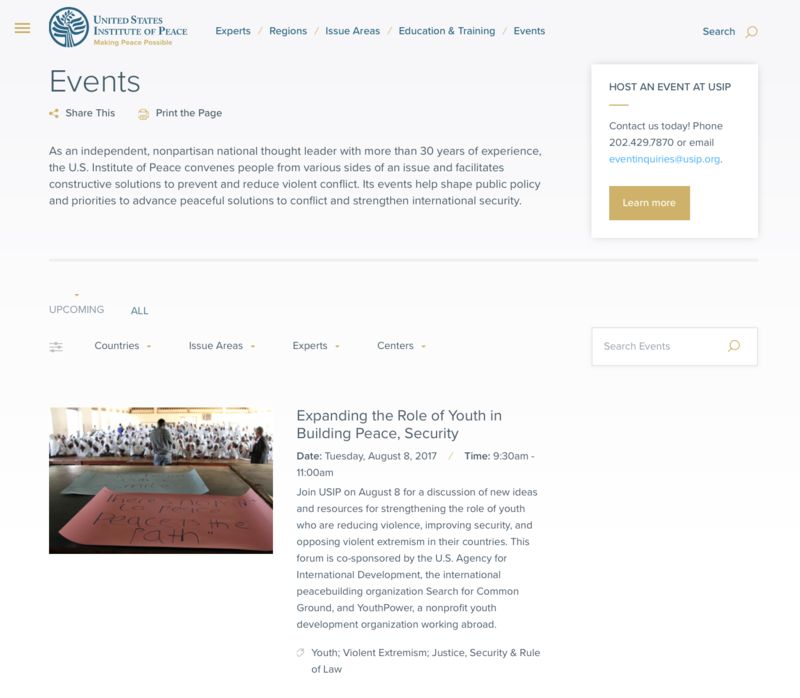 Our work created a powerful search experience for USIP users with immense control of query results, a more intuitive user experience, and improved site functionality. Nonprofits and associations, in particular, can benefit from the use of Solr for faceted search within resource centers. With a higher quality search experience in place, the open source platform invites users to navigate nonprofit or association sites with ease while still allowing for custom configurations unique to organizational needs. Solr is key in organizing and presenting clear access to key nodes, resources, or updates with content at the forefront of search results for such organizations. Want to learn how Solr can power the user search experience for your nonprofit or association website design project? Contact our expert Development team or email us at [email protected].